The #209 Flighter can also be purchased with one or the other nib here. Although I've carried the 209 Flighter in the past (with both a conventional western nib and a Chinese calligraphy nib) -- this is the first kit I've found that allows you to have the best of both worlds in one package. 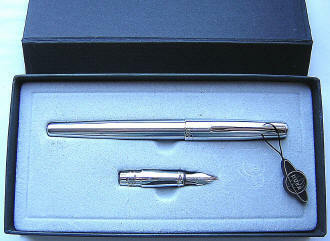 A slim, mid-sized pen, it measures 5-1/4" capped, just shy of 5-3/4" posted and 4-1/2" with cap held aside. 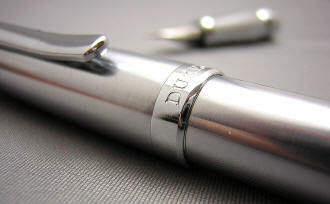 The pen has a curvaceous spring clip, and by the center cap band, which is simply engraved with 'DUKE' and '209'. The bottom of the barrel has a graceful sweep to its shape, added a distinctive silhouette to the design. Although silver in appearance, both nibs nibs are marked as 22KGP (gold plated steel) and I would rate the western nib as a light-medium, meaning that it falls between a typical western fine and medium in size. Included in the kit is a Chinese calligraphy nib, or 'art' nib. 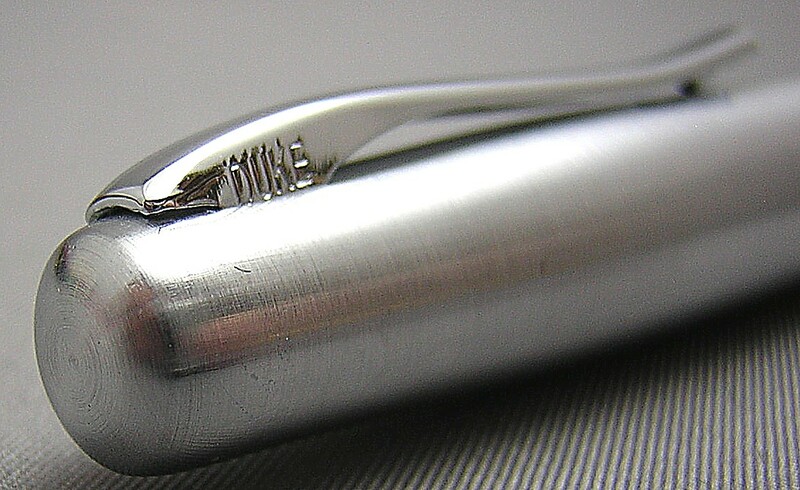 As can be seen from the upward sweep of it profile, this type of nib bears no relationship to a western-style calligraphy nib. This nib should be thought of more as a 'metal brush', designed to approximate the brushstrokes used in traditional Chinese calligraphy. Although words can indeed be written with this style of nib, it should in no way be considered a regular writing pen, and works best when held more like a traditional Chinese calligraphy brush, as illustrated to the right. 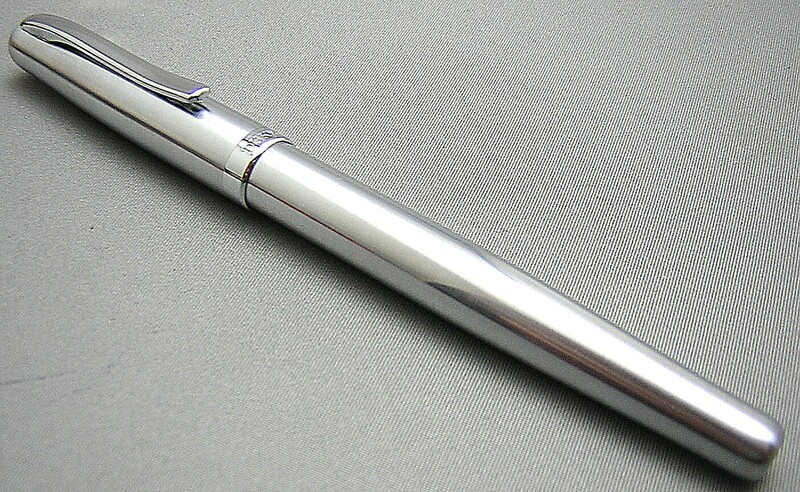 Even to describe the point as a 'light-medium' doesn't really mean too much in a conventional fountain pen sense. The thickness of the line laid down varies by how close to the tip of the nib contact is made with the paper. Touching the very tip gives the thinnest line, while moving back from the tip broadens it. Unscrewing the all-metal threads of the section from the barrel, one finds the included piston converter for bottled ink (It will also take International-style cartridges, such as those from Private Reserve). The converter includes a little agitator ball to help prevent adherence of the ink to the plastic walls of the cylinder, but it's still recommended to run a dilute solution of dishwashing soap (two or three drops to a small bowl of water) through a new pen a few times, followed by water only. Step one is effective at removing manufacturing oils that can tend to make the ink less than enthusiastic in heading from the converter to the nib, and step two removes the traces of the detergent you've used...which tends to have the opposite, diuretic effect.